Benj Henshaw, age 34, born in Tennessee; farmer; $3000 real estate; $204 personal property. Jesse Ducker, age 60, born in New York; farmer; $200 personal property. Lucinda Ducker, age 60, born in New York; farmer. Elizabeth Ducker, age 19; teacher. William Ducker, age 17; farmer. He married Harriet A. Dickey8 [Harriett A. Dickey2, Harriette A. Dickey9], Oct 21 18668, Mound City, Linn County, Kansas8. Harriet, daughter of William Cushman Dickey & Eliza A. Smith5,9,10,11, was born Oct 10 18375,9,10,11 [Oct - 183812], Wayne County, Pennsylvania5,9,10,11. Kinshaw [sic], Benjamin, age 41, born in Tennessee; farmer. Kinshaw [sic], Harriet, age 31, born in Pennsylvania; keeping house. Dickey, Almena, age 28, born in Pennsylvania; seamstress. Boya, James, age 15, born in Arkansas; working on farm. 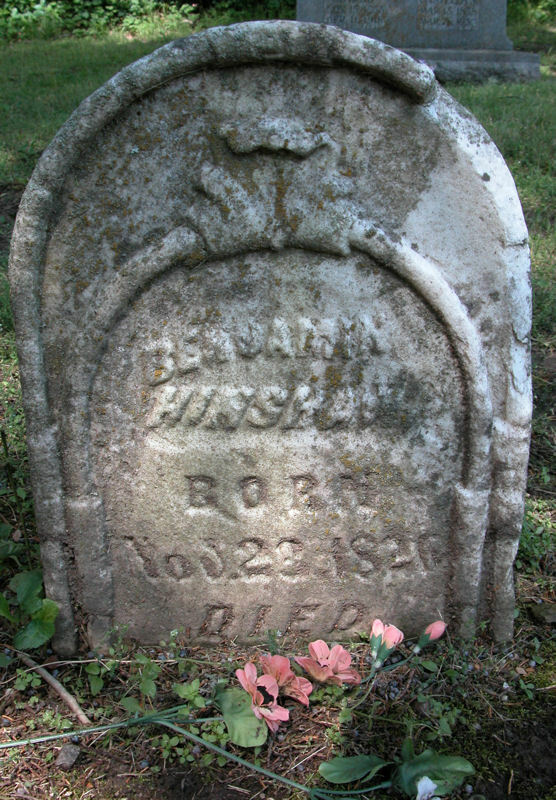 Benjamin Hinshaw died Feb 15 187413 [Feb 14 18745], at his home, two miles northeast of Mound City, Lynn County, Kansas13; buried Mount Carmel Cemetery, Pleasanton, Linn County, Kansas13. Died, on Sunday, at 1 o'clock, Feb. 15th, at his residence, two miles northeast of Mound City, Benjamin HINSHAW, age 48 years. Root, Alva D., age 45, born in Pennsylvania; farmer. Root, Harriett, wife, age 42, born in Pennsylvania; father born in Connecticut; mother born in New York; keeping house. Root, George, son, age 11, born in Kansas; parents born in Pennsylvania; attended school. Root, Charlie, son, age 8, born in Kansas; parents born in Pennsylvania; attended school. Root, Alva, son, age 1, born in Kansas; parents born in Pennsylvania. Root, Harriet, head-of-household, age 61, born Oct 1838 in Pennsylvania; father born in Connecticut; mother born in New York; widow; 1 child, 1 living; owned farm (free). Root, Alva E., son, age 21, born Jan 1879 in Kansas; parents born in Pennsylvania; married 1 year; occupation: farmer; rented farm. Root, Anna E., daughter-in-law, age 19, born Jan 1881 in Kansas; father born in Illinois; mother's birthplace unknown; married 1 year; no children. 1860 census, Paris, Paris Township, Linn County, Kansas; page 153, line #20, dwelling #1133, family #1133. Contribution from Marvin Mason (). 1860 census, Paris, Paris Township, Linn County, Kansas; page 153, line #12, dwelling #1132, family #1132. Contribution from Norman and Elaine (). 1870 census, Jackson P.O., Paris Township, Linn County, Kansas; page 90A, line #1, dwelling #156, family #141. 1880 LDS census index, Linn County, Kansas; roll T9-0386, ED 128-131, page 99D. 1900 census, Pleasanton, Potsoi Township, Linn County, Kansas; roll T623-487, ED 115, page 9B, line #57, dwelling #188, family #188. Posting Oct 4 2010 by Jim Laird () to KS-OLD-NEWSPAPERS. "The La Cygne Weekly Journal" (Linn County, Kansas), Mar 10 1877.